Location of APU Malaysia (Address of APU): APU is a 15-minutes’ drive from Kuala Lumpur in a town called Bukit Jalil. 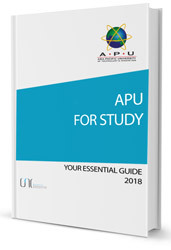 We help the students who are seeking admission in APU University (Or any other University in Malaysia), in everything from the application process and visa application and documentation to arranging for their accommodation – and even arrange to pick up the students from the airport and all in FREE of charge. We make the students familiar with the life in Malaysia and in APU University, with the help of our extended services that will make every student feel at home. In simple words, If you are looking to study in Malaysia, we will basically do everything needed that you don’t have to look anywhere else. For details about our services click here. To get started right now or for your inquiries or if you want to study in APU University, visit our Online Malaysian Universities Application System (OMUAS) or fill out the Register form from the right side. Someone from our team will get in touch with you at the earliest and will take you through the entire process – clarifying all your doubts and answering all your queries. After registering with us you can log in and upload your required documents and that is the only thing you will have to do in this whole process, we will take care of the rest. Minimum CGPA of 2/4 or Pass in High School, Secondary School or A – level. For Engineering - Physics, Chemistry and Maths compulsory in High School. Any other Certification or evidence of English proficiency that APU accepts as an equivalent to TOEFL and IELTS. In case of disqualification from the above, student needs to take the APU English Placement Test, and depending on the result of the test, he/she may require to attend the APU Intensive English Programme (IEP) prior to begining of the Foundation or Diploma programme. Documents required: The list of required documents to get admission in APU Malaysia and other Malaysian universities, which includes English language institutes can be found by click on here. There are several affordable accommodation options in Kuala Lumpur. We can help you make the right choice in accommodation with the help of our student services. The university-managed accommodation is only for APU students and students accompanied by family need to opt for private accommodation. We will help you with contact numbers of property agents. International students and students from other states may stay in university-managed accommodation or in private rental accommodation close to the campus. There is fully-managed accommodation provided by APU near the campus – namely, Endah Promenade Academia, Vista Komanwel, Fortune Park, and Covillea Condominiums. Rooms are available in single, double or triple sharing basis. study tables and WIFI (Wireless Broadband Internet). A common pantry is available at each floor and is equipped with stove, microwave oven and refrigerator. All rooms have attached bathrooms and are equipped with water heaters, bathroom mirrors with shelves and towel racks. A common kitchen is available at each apartment and is equipped with stove, microwave oven and refrigerator. All rooms have attached bathrooms and are equipped with water heaters, bathroom mirrors with shelves and towel racks. Apart from University-managed accommodation, students can arrange your accommodation in privately owned houses and apartments. In that case, students must come to KL at least 2 or 3 weeks before the commencement of the course, because looking for a suitable place to stay could be tedious and time-consuming. Accommodation type or Room type are subject to Availability and one First come, First served basis. APU provides a free shuttle bus service for its students from the accommodation which leaves every half-hourly basis. Deposit: Students need to pay 2 months deposit and one months Rental in advance in order to book a room. 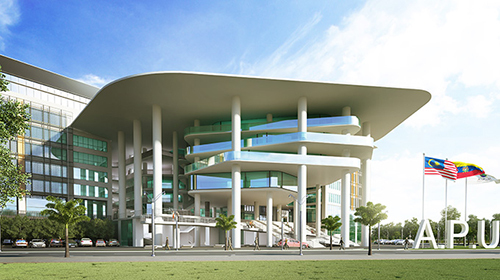 APU University offers a wide range of programs for the students to choose from. In the following tables, we have listed their available programs along with the tuition fees. * Fees stated above include Course Fee, Student ID Card Fee and Library Fee for the duration of the course. Contact us to receive detailed Fee chart. * 2-5 years for PhD programs is the minimum and maximum normal study period for students who have taken Full Time study mode. 3-6 years is the minimum and maximum normal study period for students who have taken Part-Time study mode. Contact us to receive detailed Fee chart. In APU’s efforts to deliver world class education to it students and to encourage them to perform to their full potential, the university offers some brilliant scholarships to deserving and talented students. And this is not all. APU merit scholarships recognize students with strong leadership qualities & acumen in sports - both at state & national levels. In order to give individuals, a deserving future, APU offers these scholarships so that no dreams are left unattainable for these exceptional minds. How to apply for the APU Merit Scholarships? 1. The application process should be started before you finish high school - SPM, UEC, STPM, IB, A-Levels, O-Levels and other qualifications. It is advisable to apply for the Scholarship with your estimation or trial results, as soon as they are available. 2. Scholarships can be secured by enrolling at APU along with your academic results. Note: Scholarships are limited and are available on first-come-first-serve basis. 3. Please fill the APU Merit Scholarship Application Form online and submit to us. 4. If need be, you will be advised to visit us for more information and for completing your application for the Scholarship. A host of scholarships and aids are offered by APU for students who are talented and deserving. From scholarships ranging from waiving 100% of tuition fees to scholarships awarded at the end of each year for outstanding performance in academics, there is something for everyone who wants to study and excel here at APU. 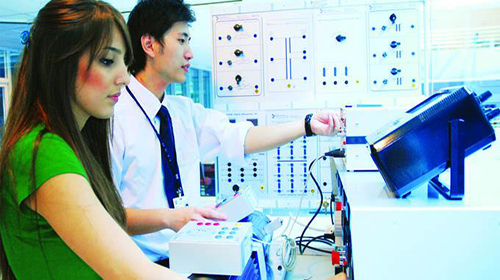 APU Malaysia or the Asia Pacific University of Technology and Innovation is one of the most popular universities across the country. 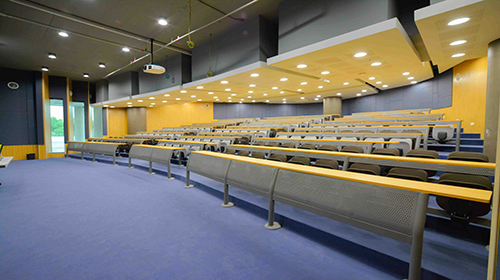 The university provides quality education in Bachelor's, Master’s and Ph.D. programs. APU College Malaysia has been churning out a lot of professionals, who are unique and creative in their problem-solving skills and talent.APU Malaysia has earned a good reputation across the world, as it has been recognized with a host of awards for excellence in education at national and international levels. 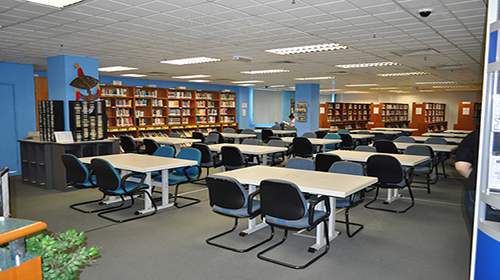 APU College Malaysia is one of the top 5 universities, which has gained its reputation across Malaysia under the SETARA 2011 rankings. The ranking is usually provided by the Ministry of Higher Education (MOHE) and Malaysian Qualifications Agency (MQA). The awards were announced by the Minister of Higher Education, Datuk Seri Mohamed Khaled Nordin on 1stNov 2012. 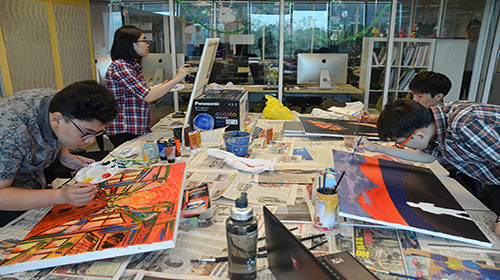 APIIT University Malaysia was founded way back in 1993 and Asia Pacific University College of Technology and Innovation was founded in 2004. Our students have made a name across different sectors with the help of our quality education and appropriate curriculum from our university. 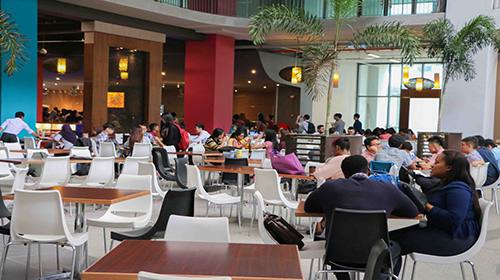 APU College Malaysia has an international student community of more than 10000across 100 countries. 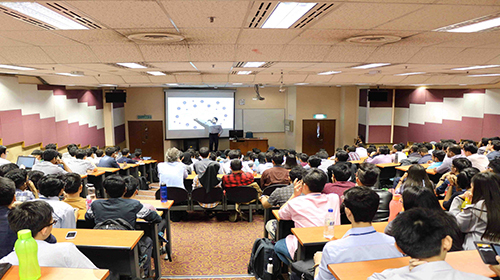 APU College Malaysia provides different course options to its students who pursue various courses according to their interest. We train our students to think differently and work efficiently in all the aspects. APU university invites student from all over the world and gives an opportunity to collaborate with other universities in the UK, US, Australia, Europe, New Zealand and South America.